Pumpkin Spice Lattes are back at Starbucks, and football season is in full effect. That can only mean one thing for marketers, you better have your holiday campaign ready to go! If you don’t it’s not too late… well, almost. It’s cool, we all procrastinate. Sometimes it’s when our best work happens. First off, let me show you some holiday campaigns of yesteryear and what made them so successful. In 2015, the coffee maker ran a holiday contest on Instagram, asking its consumers to share and tag their photos of the red cups using the hashtag #redcupcontest for a chance to win one of five prizes. This contest allowed for users to tap into their creativity and incentivized users to share their story along with Starbucks story by using UGC (User-Generated Marketing). The contest was so successful that there were over 40,000 submissions during the promotions lifetime; increasing organic chatter during the holiday months so much that you couldn’t help but want a peppermint mocha. 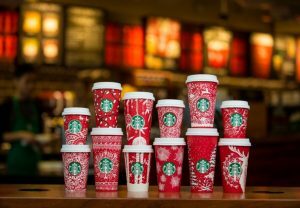 The following year, Starbucks came back by encouraging users to share their red cups that were designed by last year’s winners. In 2015, REI closed its doors on the biggest Retail day of the year, Black Friday. The Co-Op encouraged its consumers to join employees and take a day off from working… and shopping… and reconnect with what we all truly love: being outside. The campaign offered ideas of hiking trails and other outdoor adventures that consumers could do. While you may think this type of campaign is risky, to close your doors on one of the busiest days of the year, it spoke to REIs values and helped create loyalty with consumers by offering them real world experiences. As a Millennial, Budweiser’s #HolidayBuds really spoke to me. 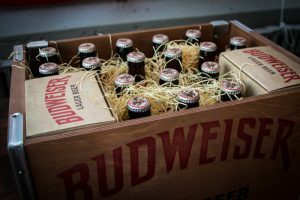 In 2014, Anheuser-Busch tried to reach the Millennial, “hipster” crowd by shipping wooden crates of Budweiser to stores. The packaging was made to resemble 3 different eras (the beginning of the prohibition, the end of the prohibition, and the 100th anniversary of the brand). Now you may be thinking “big deal, they changed the packaging”. While yes, they changed the packaging, that was only part of the promotion. The other two parts were that they encouraged users to share pictures of the product on social media (UGC again!) and then calling out your “Holiday Buds” that you would share the beer with. Being that the cases were released during the holiday months, it spoke to hometown reunions between old friends you may not have seen throughout the year because you were too busy working on your “art project.” Regardless, the brand looked to have not only an online experience but to transition it offline as they targeted a group that usually travels home (Mom and Dad’s house) for the holidays. Nothing yells out the holiday like watching a nice Yule Log video that you video On-Demand, at least in my family. A few years ago, Lagavulin Whiskey teamed up with Nick Offerman for a good ole fashion Yule Log video, where the well-known whiskey lover sat in front of a nice fire, sipping on some whiskey while staring at the camera. The brand saw this as a great opportunity to replace the traditional Yule Log videos at parties with Offerman and some branding that could be as timeless as the extended 10-hour video is. I’ll admit I’m guilty of watching the full video and maybe pouring myself a glass as well. Now that we’ve talked about some campaigns that have left their mark on the holidays. Let’s take a look at some steps you can take to make sure your holidays are set up for success as well. First, this applies to holiday and non-holidays alike. Have a content calendar! I repeat, have a content calendar. Identify what holidays or dates you want to target, whether it is Black Friday, Small Business Saturday, or any of the other events that happen around that time of year. Once you have your dates picked out, be sure to put them in your content calendar or project management tool to ensure you’re keeping track of them. Now decide what content you want to use to celebrate or highlight these dates. Secondly, as you’re thinking of what content to use, be sure to accentuate strong visual elements in your content. This can be videos, GIFs, images, or anything that will grab the user’s attention. As the holidays get closer, we recommend that you use videos or GIFs to fight against other holiday content as motion is more likely to grab a user’s attention. Third, share your brand’s story. Provide that personable appeal to your fans, by letting them know who your business is and the people who stand behind it. Think about Starbucks #RedCup campaign. While they didn’t share their personal story, they ran a campaign that helped share thousands of user’s stories and showing the different experience and perspective that Starbucks customers have. Fourth, convey emotion through content. Don’t be afraid to pull on consumer’s heart strings and share some emotion. After all, we are human, right? 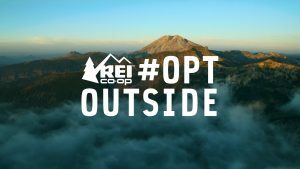 Engage your audience by creating highly relatable content, such as REI with their #OptOutside micro site. Highlighting the different outdoor adventures you could do, not only showcased their values as a brand but also instilled a sense of adventure in users that visited the site – making you want to get out there and hit the open trail. Fifth, create content that will get go viral…or try. Does the post have “thumb-stopping” power? Is it educational or entertaining? Is it something that your audience’s audience would want to see? Would you put money behind it? Are you willing to boost or promote this content? The time leading up to the holidays are the biggest consumer spending time of the year. Everyone is buying gifts and not everyone knows what they’re looking for (guilty of that). So why not help them find it? The holidays are a great time to aim the spotlight to your business and social media can be one of the best channels to help shine that light. If you need help getting a strategy set for your holiday marketing campaign or running it, contact us!